Supervisor Susan Peters (center) was among VIP guests. Milagro Center owner Allan Davis (center) hosted friends for the three-course dinner. 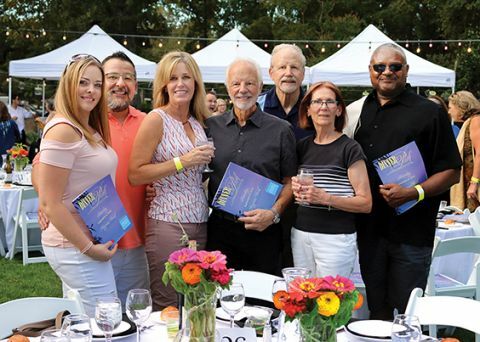 CARMICHAEL, CA (MPG) - Following the sell-out success of 2017’s inaugural event, Carmichael Park Foundation recently staged a second “Dinner in the Park” fundraiser. The gala benefits park beautification and helps fund programs offered by Carmichael Park District. Entirely al-fresco, the gathering ambled over two hidden-gem reserves. Cocktail hour was bathed by sunset in Sutter Community Garden; tables were set for a moonlit farm-to-fork meal in the adjacent Jensen Botanical Garden. Winding paths link the two venues and live music serenaded every step of the way. 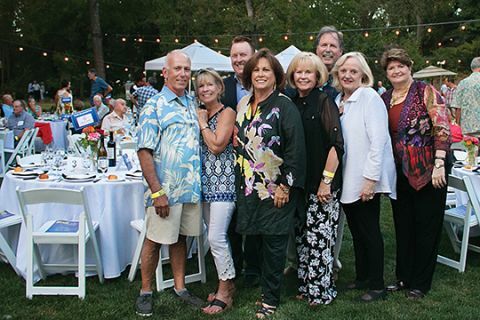 With the recent addition of 11,000 square feet of lawn to the Jenson property (sponsored by Foundation director Paul C. Pennington), 12 extra tables were available for the 2018 gala. Reservations sold out at almost 400 tickets. Local restaurants supplied appetizers. For a sit-down main course, Hawks (Granite Bay) Restaurant served grilled tri-tip and a signature fried chicken dish. Nothing Bundt Cakes bakery provided desserts. Following dinner, an auction offered a Costa Rican vacation, season theater tickets, a Napa vineyard tour and a diamond and sapphire necklace. Donated by Carmichael’s Sharif jewelers, the pendant sold for $1400. Sponsors included Charles Schwab; Dignity Health-Mercy San Juan; SMUD; KMM Services; Wells Fargo; Alpha One Ambulance; Comstock’s Magazine; BP Interiors; Peter and Anna Tateishi; Paul C. Pennington; SEIU Local 1000. For more information, visit Carmichaelparksfoundation.org.